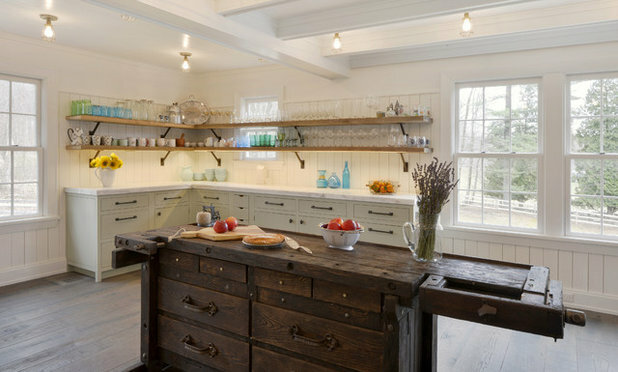 This article is from Houzz.com’s Most Popular stories file. 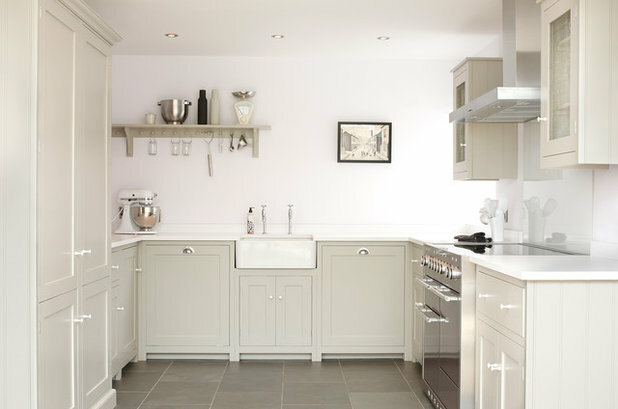 A kitchen of any size can feel roomy if you know a few tricks. 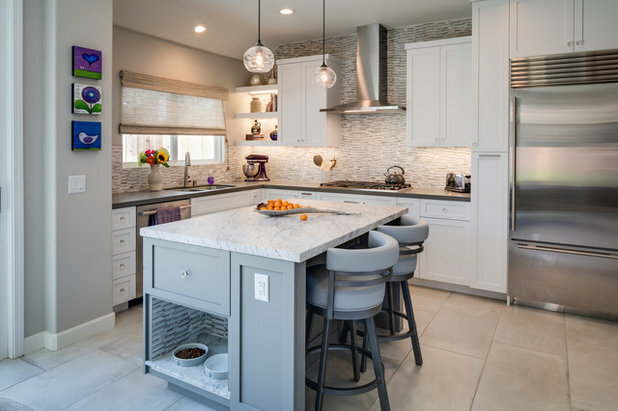 Sticking to white cabinets and walls is a good start, but there are many other ways to create extra room in your kitchen, or create the illusion of a bigger space than you have, all without sacrificing a sense of personality. 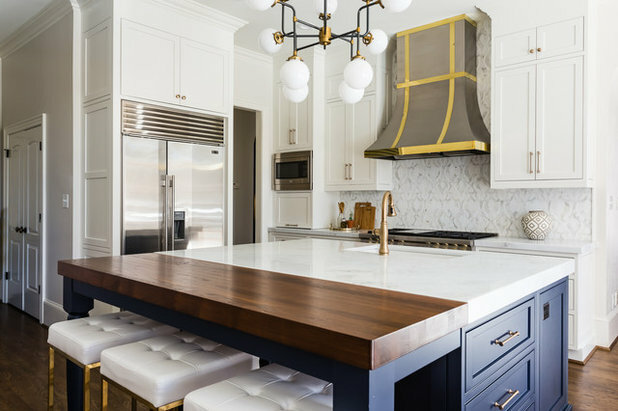 Here are 12 of my favorite ways to balance storage, style and long sightlines to get a functional layout with a spacious vibe. 1. 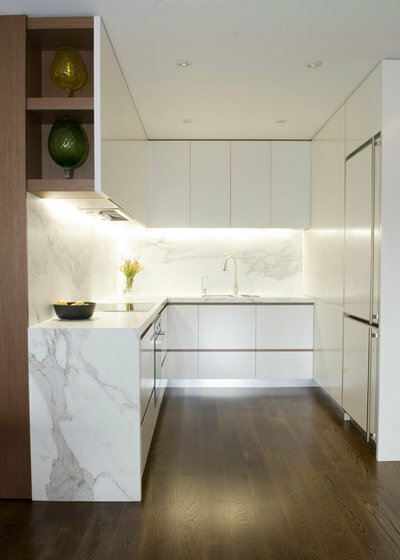 Consider shallow cabinets. Here’s some outside-the-box thinking: Not all of your lower cabinets must be the standard 24-inch depth. 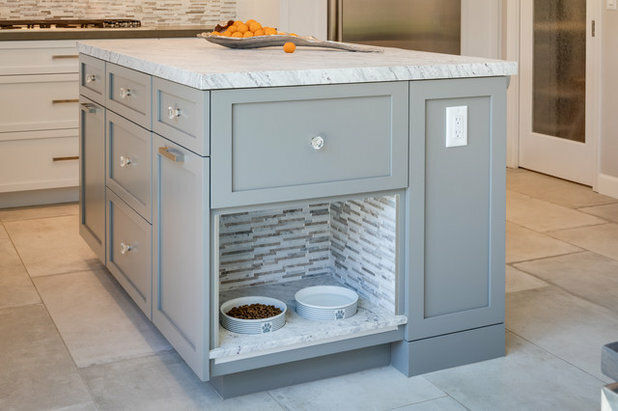 Most cabinet lines (even stock cabinets from big box stores) also come in a 12- or 15-inch depth usually used for upper cabinets. 2. Reduce your hardware. 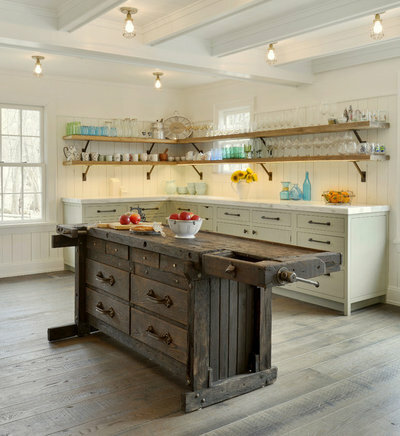 It’s a no-brainer that eliminating counter clutter is important for keeping a kitchen looking open and breezy, but you can take this a step further by removing the hardware. 3. Rethink the double sink. Clients often request a double sink — sometimes before anything else. 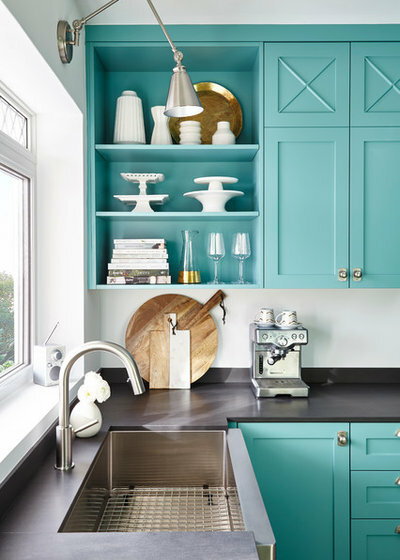 Large double sinks have their uses, but if you’re willing to compromise and choose a single sink (or even a one-and-a-half sink with a slim second bowl), it can open up better storage options and more unbroken counter space. This applies especially to stock cabinet lines, which include a limited number of size options. 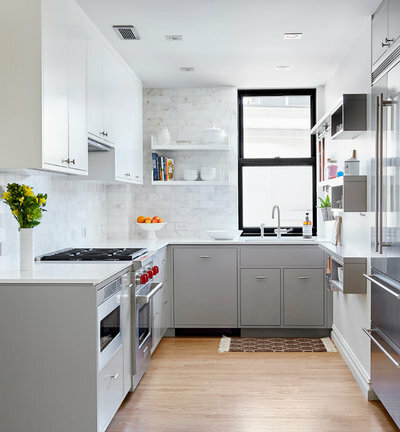 For example, switching from a 36-inch sink cabinet (for a double sink) to a 24-inch cabinet (for a single sink) frees up 6 inches on both sides. This can turn 6 inches of adjacent space into 12 inches, which is enough for a usable cabinet. 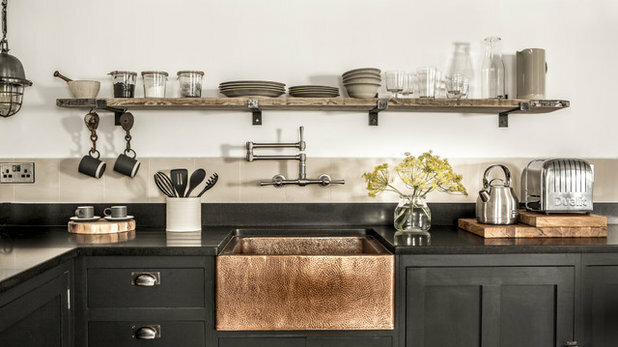 If you don’t think you’ll use that second sink bowl frequently, it’s worth exploring what else that space could be used for. 4. Choose a compact dishwasher. 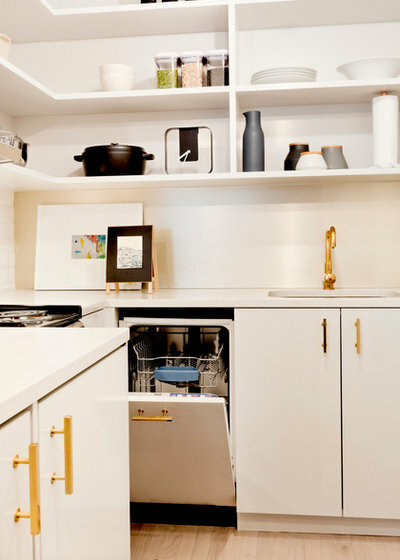 Most standard dishwashers come in a 24-inch width, but compact or “condo-sized” dishwashers in an 18-inch width are growing in popularity. 5. Put your fridge on a diet. 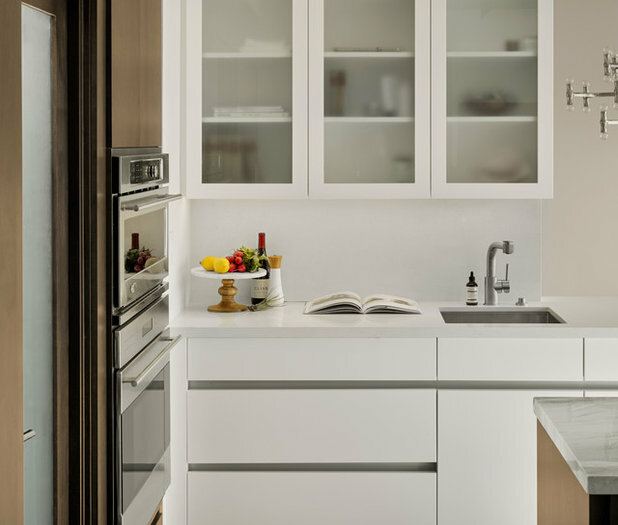 Speaking of saving inches, choosing a slimmer refrigerator can really open up your kitchen as well. 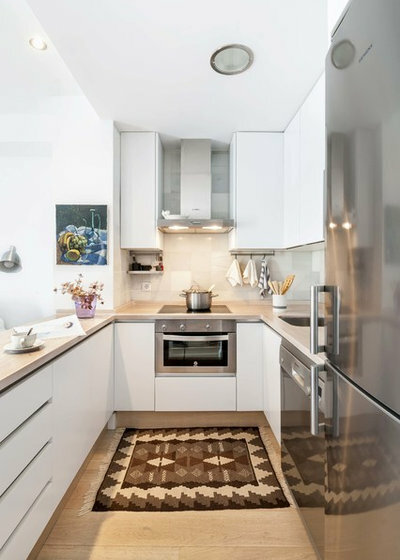 Clients usually want the largest fridge they can fit, but these large 36-inches-and-up models often end up full of clutter or simply remain half empty. 6. Use panel appliances. Not prepared to choose compact appliances? You can still get a much lighter look. 7. Mirror your backsplash. When you’re tucked into the kitchen working away on dinner, that’s when the space usually feels the smallest. 8. Use shelf uppers. 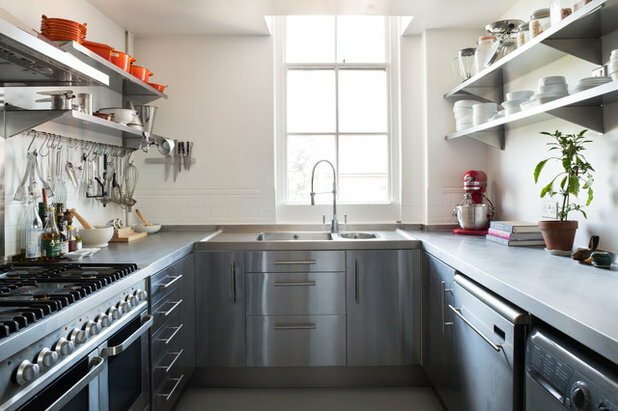 In a small kitchen, removing all the upper cabinets may not be a practical option, but you can always use as much or as little as you like to house just your most attractive everyday items. 9. Add glass door cabinets. Here’s another way to lighten your uppers, but without actually changing your storage. 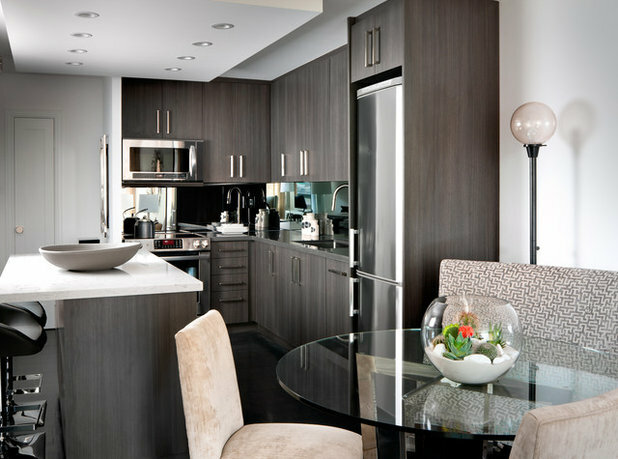 Switch out typical solid cabinet fronts to doors with glass inserts to make the look much airier. 10. 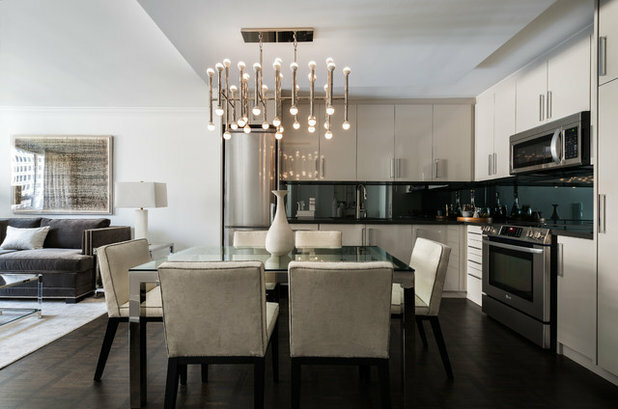 Install cabinet lighting. 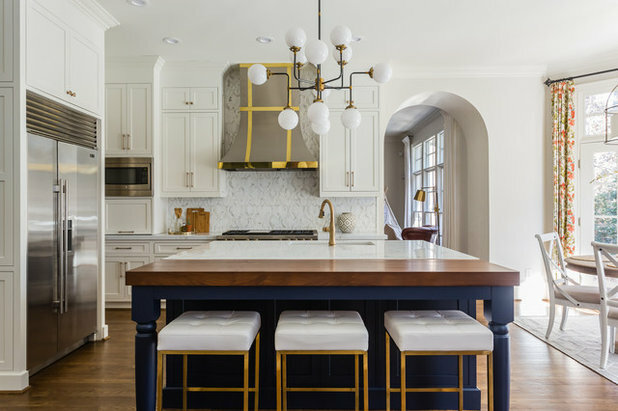 The importance of good lighting cannot be stressed enough, and in kitchens especially the lighting is often insufficient, coming just from ceiling fixtures in the center of the room. 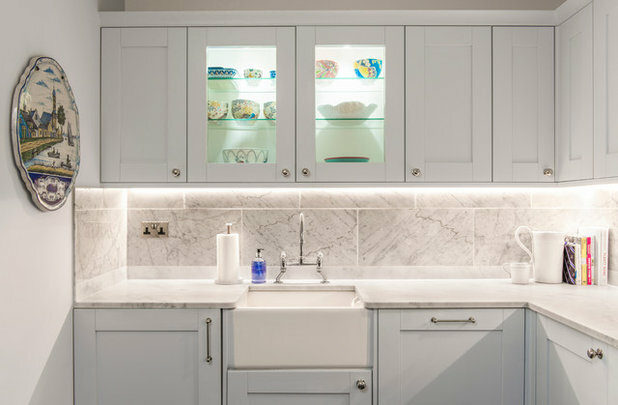 Add lighting under, above and even inside the cabinets to make the room feel much brighter and bigger, as the dark shadows around the cabinets would otherwise visually shrink the space. 11. 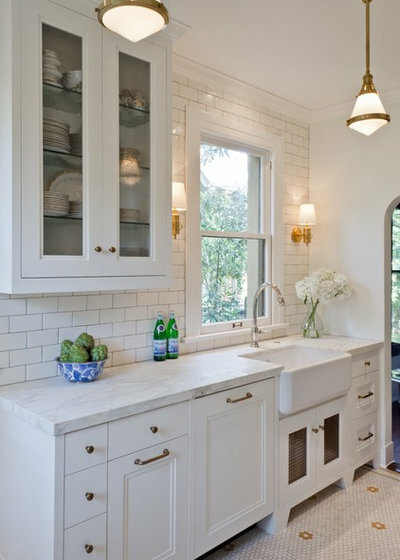 Use a short backsplash. So you’ve carefully configured your storage, and now you’ve got some beautiful open wall space. To make that wall look 10 feet tall (even if it’s only 8), try using a short, minimal backsplash in a color that blends with the wall. The lack of an obvious dividing line between where the tile stops and the plain wall starts keeps the planes of the wall looking taller, so your open space looks positively vast. 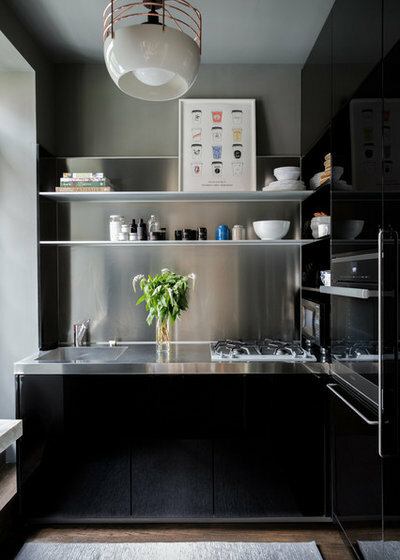 Try a stainless steel backsplash to present a subtle sheen that almost acts like a mirror (as discussed above), giving the room a sense of depth and echoing the finishes of steel appliances or fixtures.